Beautifully formed acrylic Scottie/Scotty Dog cuff bangle. Acrylic & Swarovski crystals. Various colours available. The dog measures 5.5cm/55mm. The band is 3.5cm/35mm wide. Cuff is 7cm/70mm (widest part of the oval). 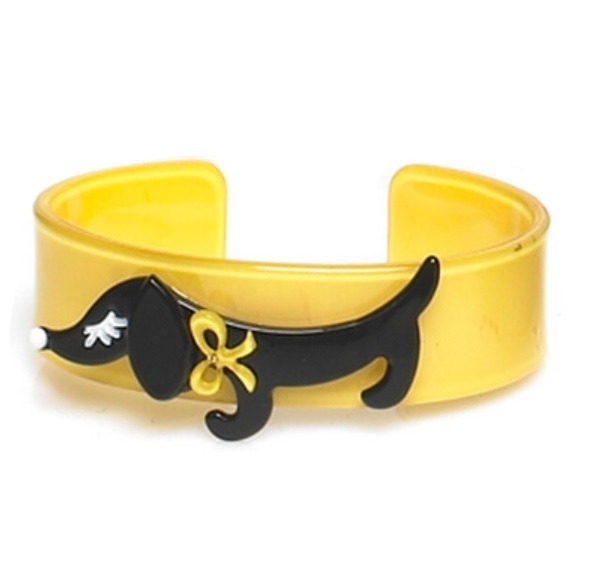 Really sweet sausage 'Dachshund' dog cuff bangle. The dog measures 4cm/40mm long. The band is 2cm/20mm wide. Cuff is 6.8cm/68mm (widest part of the oval). Yellow with a black dog. Beautifully formed 3D acrylic rose cuff in a cornflower blue. Flower measures 4cm/40mm diameter. The band is 2cm/20mm wide. Cuff is 6.8cm/68mm (widest part of the oval). Beautifully formed 3D acrylic rose cuff in pale green. Flower measures 4cm/40mm diameter. The band is 2cm/20mm wide. Cuff is 6.8cm/68mm (widest part of the oval). Beautifully formed 3D acrylic rose cuff in dusty pink. Flower measures 4cm/40mm diameter. The band is 2cm/20mm wide. Cuff is 6.8cm/68mm (widest part of the oval). Beautifully formed 3D acrylic rose cuff in a mid-grey. Flower measures 4cm/40mm diameter. The band is 2cm/20mm wide. Cuff is 6.8cm/68mm (widest part of the oval). Really pretty bow cuff bangle in a rich cholcolate brown matched with bright cerise pink. The bow measures 7cm/70mm (widest part). The band is 2.8cm/28mm wide. Cuff is 6.8cm/68mm (widest part of the oval). This has a slight mark in the acrylic but nothing major. Really pretty bow cuff bangle in a darker toned grey with a pastel pink bow. The bow measures 7cm/70mm (widest part). The band is 2.8cm/28mm wide. Cuff is 6.8cm/68mm (widest part of the oval). Bird with flower cuff. Dusty pink and mid-grey. Bird measures 7cm/70mm. The band is 3.5cm/35mm wide. Cuff is 7cm/70mm (widest part of the oval). They do not adjust. Bird with flower cuff. Dusty pink and pale duck-egg blue. Bird measures 7cm/70mm. The band is 3.5cm/35mm wide. Cuff is 7cm/70mm (widest part of the oval). They do not adjust.